1780 Cork Silver and things much more valuable! We’ve never ever been to an auction but for some reason, wandering around Cork City on a miserable Saturday in June (yep …rain, rain, rain!) we spotted a sign outside Woodwards Auctioneers on Cook Street. They were showing a preview of items that would be on auction the following week so for some reason we decided that we would have a little snoop around to see what all of this “auction” stuff was about. The items on display were apparently from a few estates and there was a huge mix of furniture, ornaments, paintings and other assorted bits and pieces. There was even a pair of children’s shoes that were made by a prisoner in 1916! After a few minutes in the display hall I heard my name being called and I spotted Pascal McNamara who is the Antique Auction Manager. Up until now I had only ever bumped into Pascal on the street and we always have fascinating chats about all sorts. It always struck me how much he loves Cork and the incredible knowledge he has about our city. Pascal was standing behind an impressive display of silver, which was part of the following weeks auction. A minute later we found ourselves totally mesmerised by Pascal, listening to stories about the history of Cork silver as he showed us some items from the display. 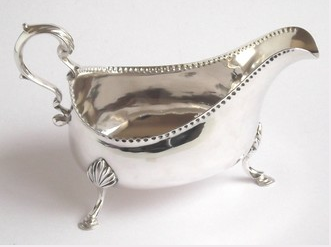 He showed us his favourite piece, a large Cork George III silver sauceboat by John Warner circa 1780. To be honest I had no real interest in silver or anything like this but this piece came to life for me after listening to Pascal telling us passionately about the history of Cork silver. He spoke of the pride we should have in the Cork craftspeople who carefully manufactured these beautiful pieces. 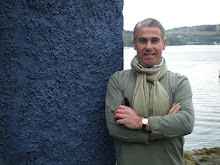 Pascal told us the incredible story of what he called the “Golden Age of Cork Silver” which can be found in his Antiques, Art & Interiors blog, where he talks passionately about his work. We stole a little bit too much of his time but decided we would come back for the auction. We left the display hall to get on with our Saturday with a little spring in our step, a little extra pride in our city and its history and an interest in antiques! I reflected on the precious 1780 Cork Silver that would be going on auction but also on the even more valuable Pascal McNamara who’s passion for what he does brought the silver to life and left both of us totally mesmerised. In all of our businesses the most valuable thing we will ever have is people who are passionate about what they do. Pascal …thank you for sharing your passion. This entry was posted on June 17, 2012 at 6:10 pm and is filed under Customer Care, Marketing, Uncategorized. You can follow any responses to this entry through the RSS 2.0 feed. You can leave a response, or trackback from your own site. about what they do.” While this is true of some employers, unfortunately others do not realise the value of the individuals who work with them. thanks for the positive feedback Trich – there’s a lesson in everything, even in Cork silver !! Most ‘Cork’ silver was made by French Huguenots – but you’re right Greg it is great that Pascal is so passionate about his work and customers and friends do respond to this passion. Greg. Thanks for the comments. We are passionate about what we do. After five generations, its in the blood ! We strive to serve and feel that we are contributing to the fabric of Cork and hope that we have helped people by achieving the best results for them, be it selling their house in the best way, helping them buy their house, selling the contents or giving them the information needed to make a purchase. In reply to Joan – you are correct in the main, but the items were made in Cork. These Huguenots also trained the following generation of Silversmiths. Great to see you online Tom and thanks for the comments. Keep up the great work!